Migg33 is an instant messenger client for Java supported mobile phones, Blackberry and iPhone. It’s just like Talkonaut, Nimbuzz and eBuddy, with some more advanced features than few of the list. Migg33 supports instant messaging over Google Talk, Yahoo messenger, AIM, ICQ, AOL and MSN messenger. 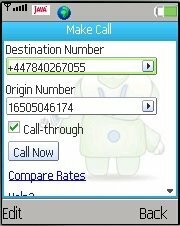 Migg33 also has a VOIP feature that lets you to call any mobile /land line with cheap rates when compared with local operators. Download mig33 mobile instant messenger here. The main advantage of Migg33 when compared with Talkonut and other mobile VOIP clients is its size. Migg33 is only 160KB in size so that it can be installed in every Java supported phone with a suitable data plan. It Supports Instant messaging over GTalk, Yahoo messenger, MSN and ICQ. Migg33 is ultra low weight application that can work on any phone, including Blackberry and Windows mobile. User profiles, tabbed interface email support, emotions and other required IM features are available on Migg33. User can change theme and language options on Mig33 interface. Cheap calls and SMS from Migg33 to any mobile device. You can invite your friends to join Migg33 and earn credits. These credits can be used to purchase Migg33 SMS, Voice calls, Wallpapers, ring tones and more. Migg33 is now available for Nokia, Android and Windows mobile handsets. i need mig33 i phone4 version….can any one help…. !